“Cutwater Boats - A New Name with a Long History.” This is an apt description for this west coast Monroe, Washington builder, a division of Fluid Motion, LLC, and manufacturer of the popular fleet of Ranger Tugs. 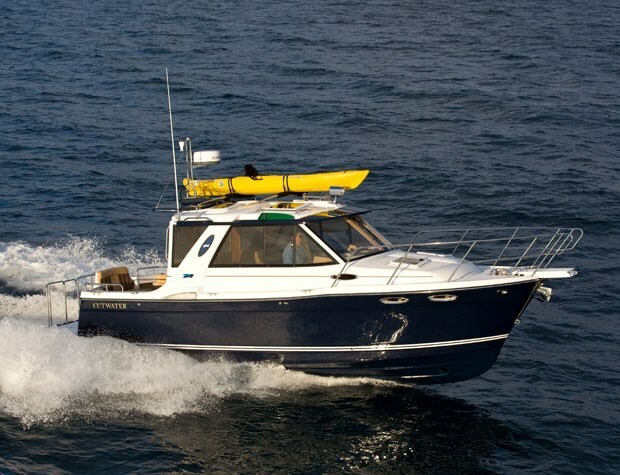 Even though built with all of the essential west coast cruising features and comforts, Cutwater describes all of its models as being “a contemporary interpretation of the classic downeast style.” There are six Cutwater models for 2015 ranging from the Solara 24 which is outboard or sterndrive powered, the C26 and C28, plus three thirty foot models. All models have standard hardtops; all but one have a sedan bulkhead enclosing the interior; and one is a dual-station command bridge. All but the Solara are single diesel inboard powered. Cutwater is proud to point out its “revolutionary, new, landmark Cutwater Keel Stepped Hull Design” which it says is “a radical departure from conventional deep-V hull geometry.” Even though the C26 has essentially a full-length keel, the boat’s draft at rest is a relatively shallow 28 inches. Starting at the bow, a raked stem curves downward to a near-vertical forefoot which Cutwater says not only cuts waves but also extends the waterline length for increased fuel efficiency and creates greater interior useable space. A keel pad runs the full length of the hull bottom while the “stepped hull bottom with tapered intake tunnels” contributes to reducing drag and increasing hull speed and fuel efficiency. A skeg keel along the aft-most third of the hull improves straight-line tracking while resisting rolling and providing protection for the propeller and rudder. 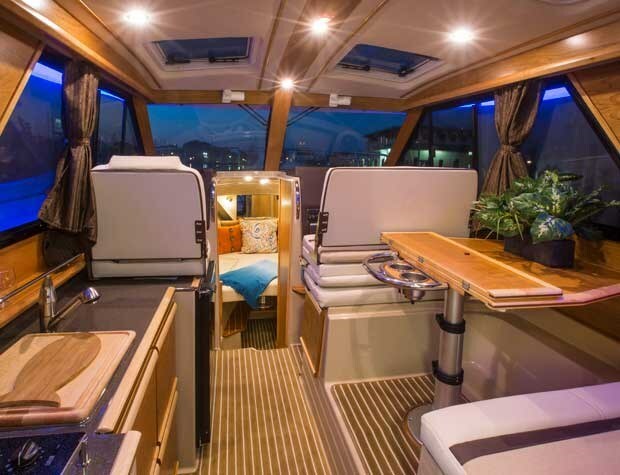 The Cutwater C26, subject of this review, is almost identical in interior layout and features to its bigger sister C28, the difference of just over two feet being in the length of the cockpit. 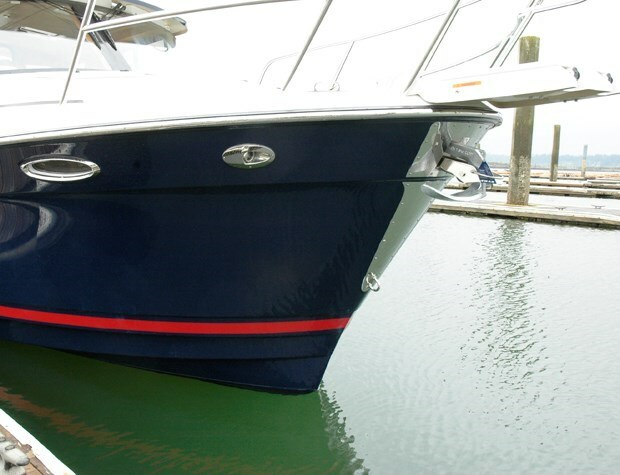 At twenty-six feet, one inch (molded) length overall (30’, 4” with platform and pulpit) on a trailerable eight foot, six inch beam, the C26 includes considerably more very expensive standard features not normally found on cruisers of this size. Some of these “extra” standard features include a 220 horsepower Volvo D3 diesel inboard with colour engine function display including fuel-flow data and electronic controls, both bow and stern thrusters, anchor windlass with both helm and bow controls, teak and holly cabin sole, bow platform complete with a covered and recessed 4-step beach access ladder, trim tabs, cockpit raw water washdown, docking lights, four batteries complete with 3-bank, 20 amp battery charger, cabin heater, two foredeck hatches with screens, four hardtop hatches with screens, remote control spotlight, a hardtop-mounted sports rack, a stainless steel hinged mast, plus dual articulated windshield wipers. The swim platform on the C26 has three integrated fenders along its aft edge to prevent dock or dinghy chafing plus a recessed, covered starboard side telescoping boarding ladder and is large enough for tender storage. An optional set of high safety rails with chains along the aft surface of this platform are ideal for additional security, mounting of a barbeque, or for tie downs. A starboard side transom door leads to the self-draining cockpit which is complete with a port side cabinet with ice chest plus storage and a hinged two-person reversible, centre transom-mounted upholstered seat provides forward or aft-facing seating. To port when entering through the cabin door is the galley which extends forward to the single passenger seat, the seatback of which folds forward to extend the galley counter space. A two-burner electric stove, under-counter large refrigerator/freezer, plus stainless steel sink with hot and cold water is all standard along with lots of cupboards and storage. Opposite on the starboard side is a four-seater convertible dinette with a hi-lo table which has a folding top section exposing cocktail table-style drinkholders. 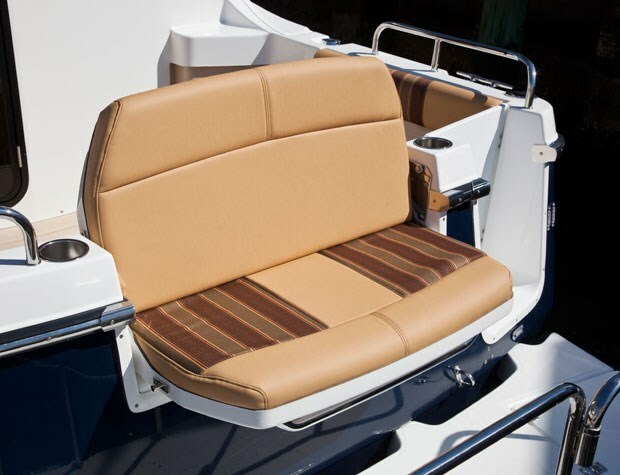 The forward double-wide seatback of this dinette is hinged to become the helm seatback. The forward V-berth has a removable centre cushion with a second table for additional cabin seating. 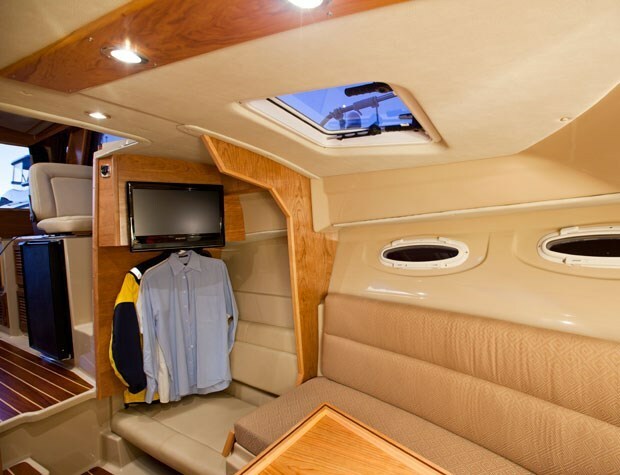 A hanging locker is to port and a head compartment to starboard complete with six-foot headroom, vessel sink, vanity, shower, a skylight, and an electric head. 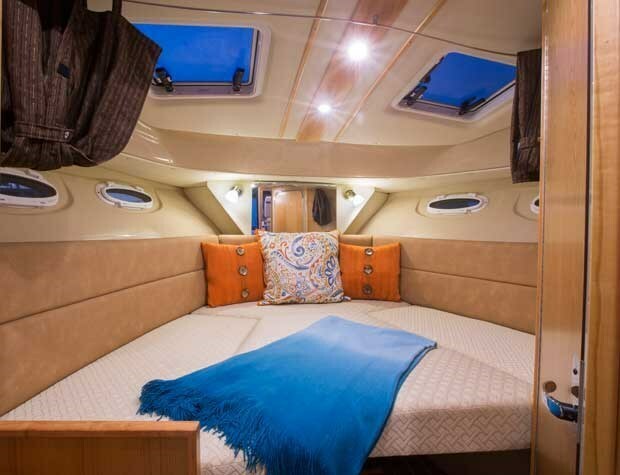 Beneath the starboard side dinette is a seven foot long mid-cabin berth for two guests. Sleeping accommodation totals six adults. 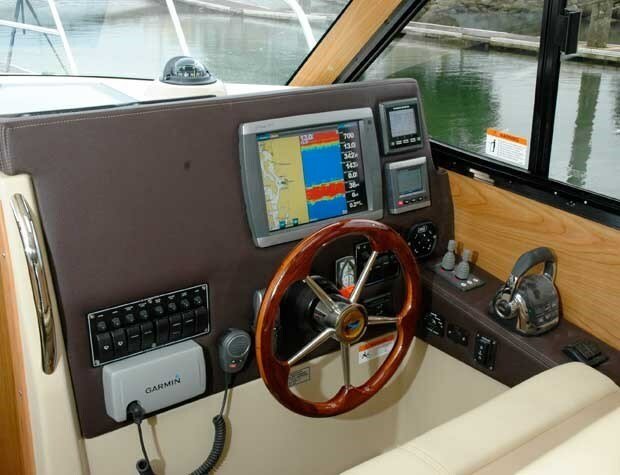 Other notable standard equipment on the C26 includes opening cabin side windows, AM/FM Fusion stereo system with iPod adapter and four speakers, shorepower, and a Garmin VHF radio. 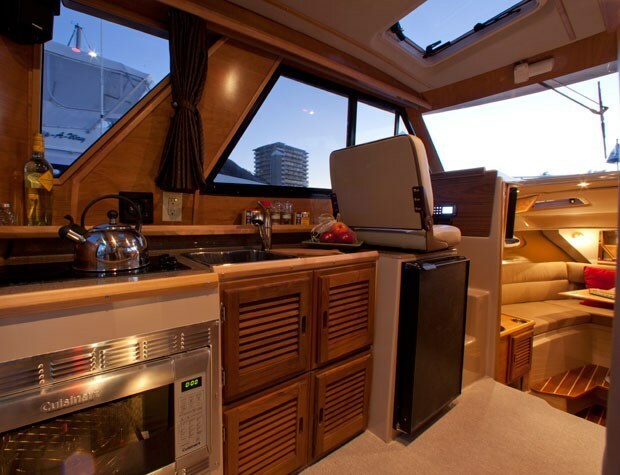 Notable optional equipment includes a Mase diesel generator with sound shield, cabin air conditioning/heating, a diesel forced air heater, entertainment package with TV and DVD, microwave, propane stovetop, 1500 watt inverter, aft cockpit sunshade or bimini, Garmin autopilot and AIS (Automatic Identification System) and 7212 navigation package including GPS and radar, and even a RIB dinghy and a 140 watt rooftop solar panel.